I was out all day with My Dad, yesterday. We were on assignment – tracking down some deadbeat to serve him with a court summons. My Dad can get pretty imaginative with finding people. Sometimes he asks me my opinion…that usually results in a long conversation. Like I said, I am very chatty. Anyway, we drove down to Summit, a little industrial pocket situated off of I-55, close to the sewage evaporation ponds. I know, that sounds pretty cool. My Dad saw this guy’s car parked next to a garage that had an apartment built on top of it. Yep, the guy was up there and he even answered the door. He was cool with it. My Dad stopped at the Hinsdale Oasis on I-294 and bought me two plain McDonald’s burgers – the little ones. I’m OK with that. My Dad breaks them up into bite size pieces because I have a very big throat and can swallow food without chewing. My Dad always says, “Codeman, chew, enjoy your food…” Not if I can help it. We continued out west to the DuPage County Court facility. My Dad rolled the windows down a bit before leaving to review some records. He carries a bottle of water and a bowl in the Scion. Every time we stop, My Dad pours water in the bowl…all that barking makes me thirsty…My Dad is very thoughtful. 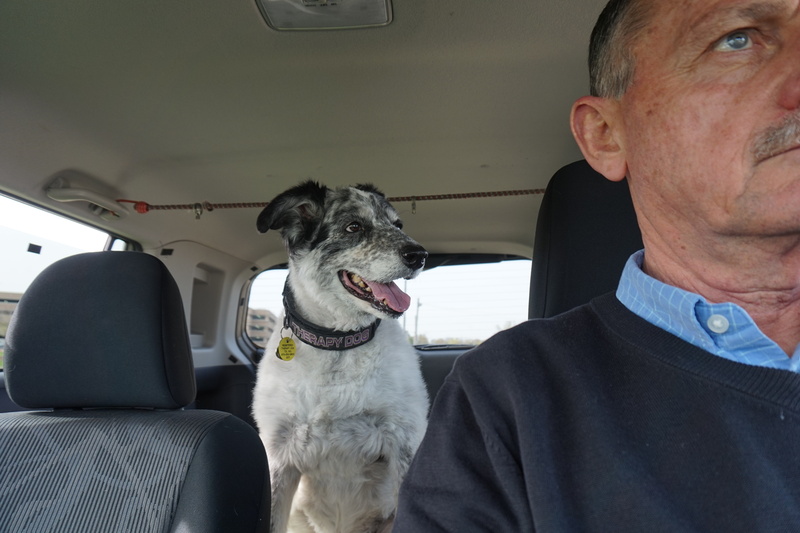 Remember, My Dad had soccer on Sunday so I got a ride in the car to Glenview. I met another soccer referee’s dog, his name is LEONIDAS, I think. He has all of his equipment, if you know what I mean. But he was cool, not pushy or trying to dominate me, but then again he was only about 30 pounds…if that. The referee said that Leonidas is a Jack Russell. He sure could jump! Straight up, like a ball coming off the concrete. He peed a lot, always covering my spots…whatever, dude. I think he picked up on that I am an Alpha male – but I am very subtle about it. He didn’t get snippy or try to mount me from behind, so, no harm, no foul. RIDING SHOTGUN IN THE SCION…THAT’S MY DAD, THERE. 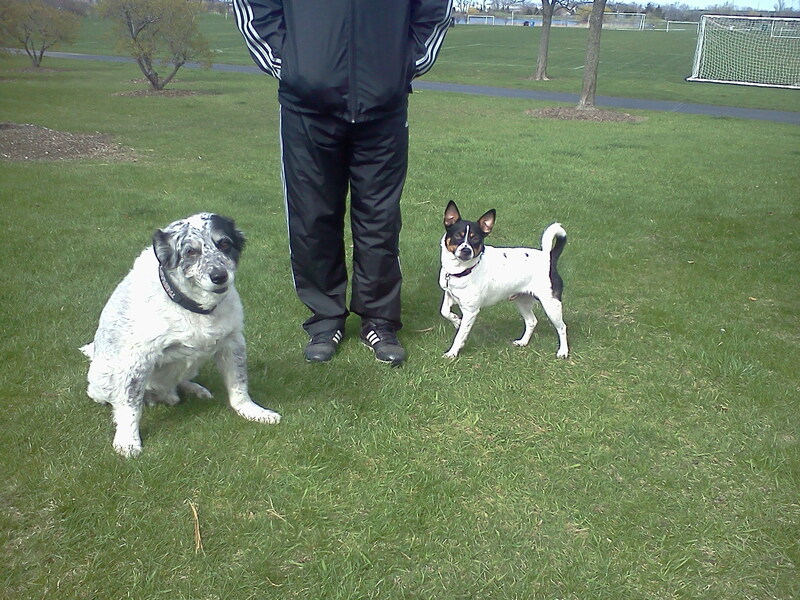 HERE I AM AT THE SOCCER FIELDS IN GLENVIEW. LEONIDAS IS POSING…DON’T ASK ME WHY. I think it’s great that you deliver court papers with your dad in the Scion. I have had court papers delivered before too! That’s because my landlord sued me several years ago. Everyone said to hide from that court paper man, but I think that’s just dumb. He was super nice, because he said I was his easiest “delivery”. Lol. I went to court, and I won. What goes around comes around:) I love to read about your adventures. You are a wonderful dog. Cody,your adventures today made me smile in that last photo you seem to have a grin on your face. HA! That’s not smiling, that’s LAUGHING. I L-O-V-E to ride in the car. NOTHING beats going in the car, sticking my speckled face out the left rear window and looking for all the trucks I know and despise. Auto-carriers, FEDEX, UPS, the Mail Man. I think My Dad ordered a WOOF and BORDER COLLIE magnet to place just below my favorite window to bark from…I’m pretty sure we’ll post a story about the magnets when we receive them from CafePress.